From the very beginning, Playwright Roberto Williams knew that he wanted FATHERS OF THE DARK KNIGHT to have a dark, theatrical feel to it. He also knew that he wanted to incorporate all of the signature Batman moments that every fan hopes to see reproduced right from the pages of the comics. To him, the stage play simply would not feel complete if it did not include a sequence from the roof of Police Headquarters featuring POLICE COMMISSIONER GORDON summoning the Dynamic Duo with the massive "BAT SIGNAL" SEARCHLIGHT! ROBERTO WILLIAMS: "I knew that featuring the Bat Signal as a full-sized stage prop was not going to be an easy task. After all, one does NOT simply go to a lighting supplier, rent a huge searchlight, and then slap a bat emblem upon its face so that it can be used as a stage prop in a community theater play! 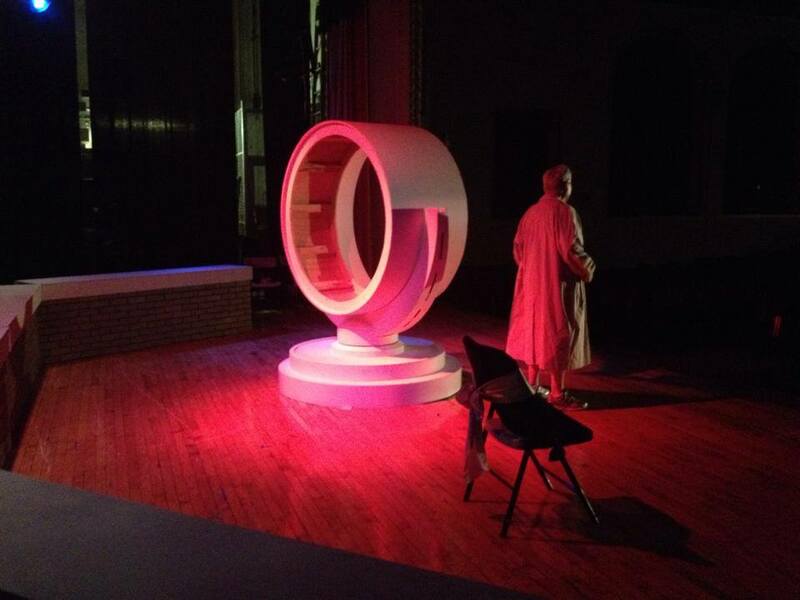 And most community theater stages were unlikely to be able to accommodate the weight of a single three ton prop! No, there was simply no way around it. It took me a while to discover this, but a prop like this was going to have to be BUILT. And just like the costumes and other props in this production, a keen attention to detail was going to be of paramount importance to me if the audience was going to be excited by the Bat Signal’s appearance, and if they were going to accept its authenticity without question." 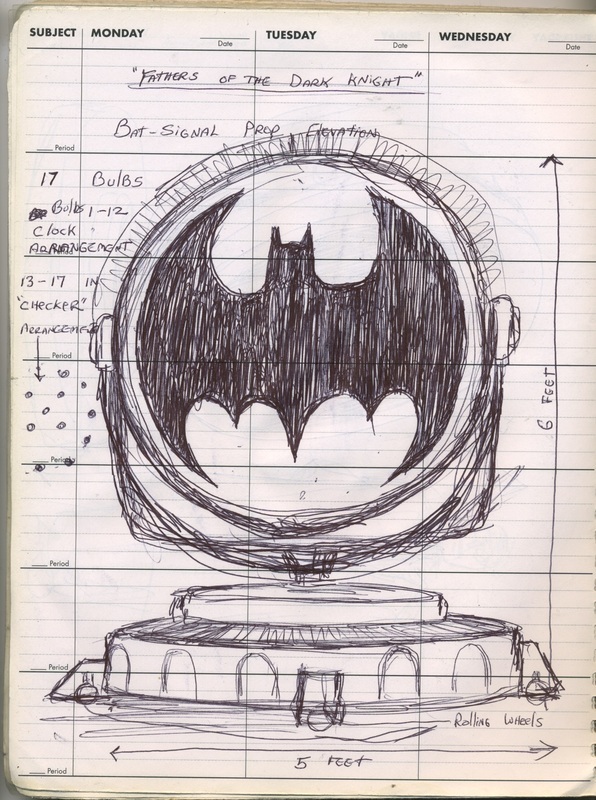 For the sake of theatrical drama, Mr. Williams felt that The Bat Signal stage prop should be a large design… something that would dwarf the actors on stage and impress with its scale and functionality. He also wanted a design that suggested a classic, bygone era… something that felt old, industrial, and powerful… and something that suggested Jim Gordon’s military roots. ROBERTO WILLIAMS: "I remember first being introduced to The Batman mythology while watching reruns of the 1966 Adam West Batman TV series as a little boy in the early 1970's. Despite its campy tone, the show was a marvel of production design in all of its sets and props… all, that is, except for the Bat Signal. The prop did not appear in the show regularly. However, when it did, I remember always being confused by what I was looking at. The Bat Signal (as presented) just never looked like a searchlight to me, and I simply could not understand why Chief O’Hara would use a marching band Bass Drum with a bat emblem printed on its face to call the Caped Crusaders!" The Bat Signal as seen in the comic books of the 1970’s was generally depicted as a large device. Issue #466 of Batman’s Detective Comics had the Caped Crusader facing off against The Signalman, and the Bat Signal was featured somewhat prominently in the storyline. 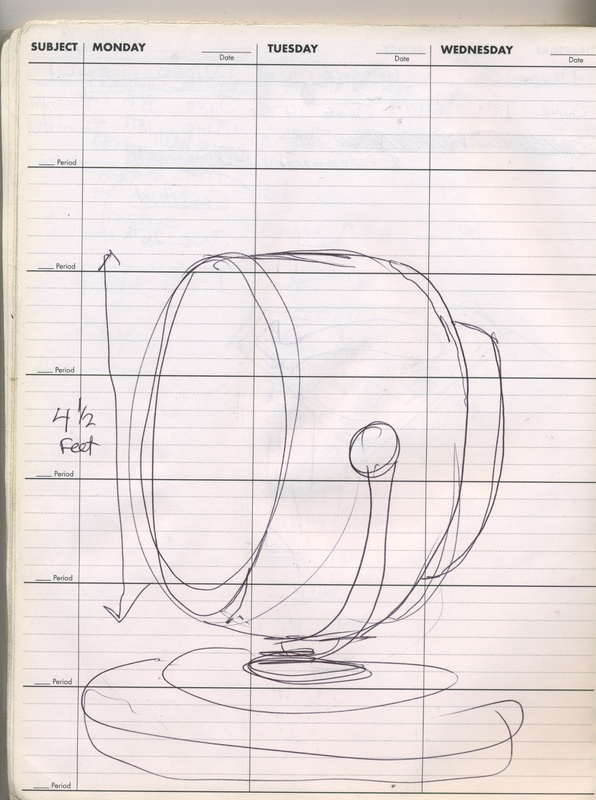 The prop was rendered as a big drum-like disk mounted on a basic bracket. Beyond that, there were no real details to speak of. HOLY MINIATURIZATION!!! SMALL SIGNALS ARE SPARSE!! 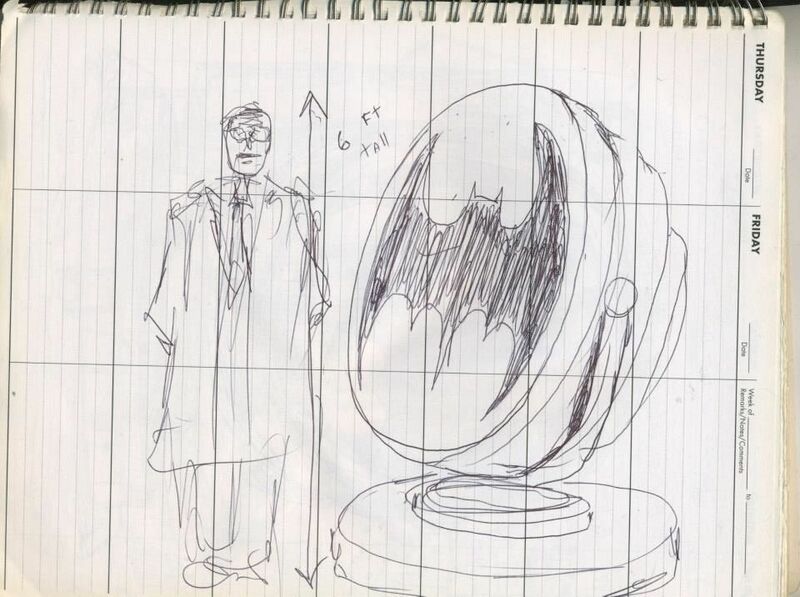 There has never been much in the way of toys or miniature collectibles that could serve as a detailed reference for a life-size Bat Signal prop. 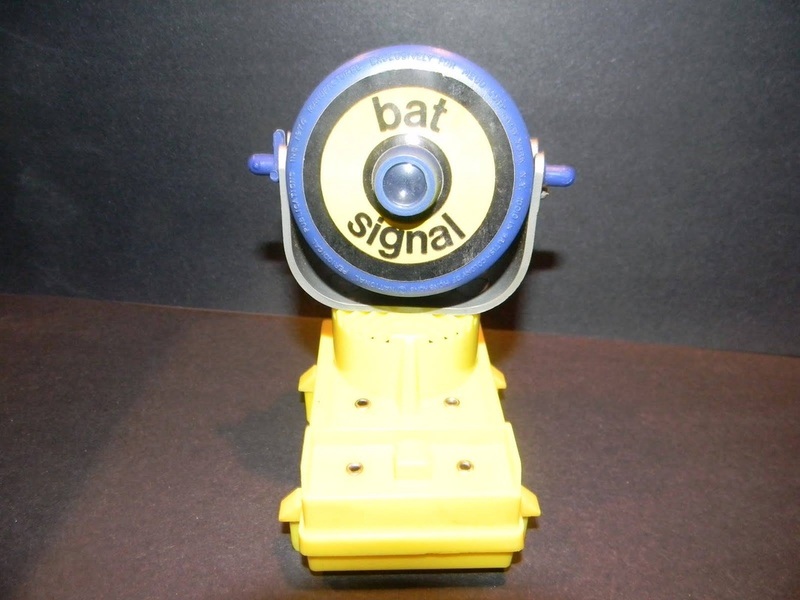 The MEGO toy corporation created a cute light-up toy Bat Signal prop to go along with their Batcave Playset back in 1974. No help there for reference. 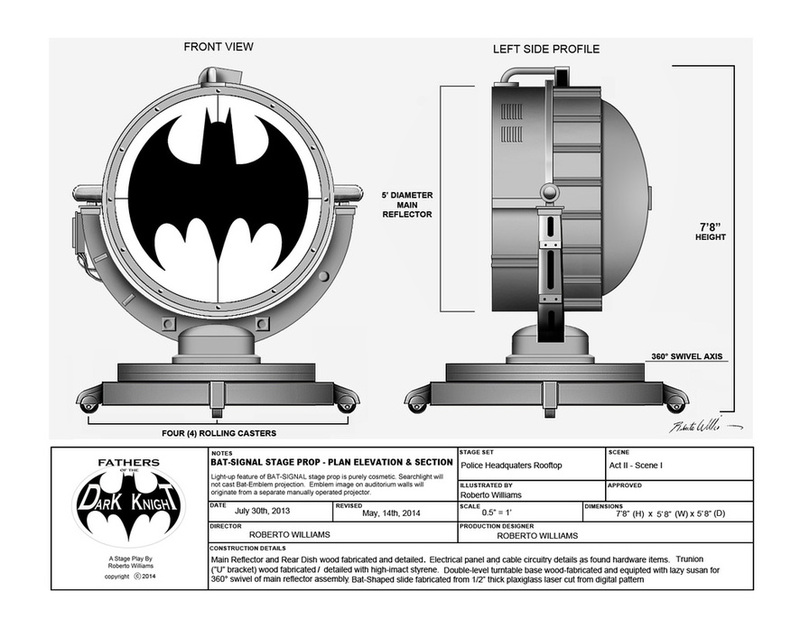 In April of 2001, DC DIRECT released a very nice Batsignal Official Prop Replica which featured a decent basic design configuration of the searchlight. A clever, engraved plaque at the back of the signal warned that the device was “… to be activated by order of Commissioner James W. Gordon…” and that “ Any unauthorized use is illegal and punishable by law…”There was also raised lettering at the circular base of the searchlight which read “For Emergency Use Only” and “Property Of The Gotham City Police Department”. Beside these details, the prop offered little else in terms of structural reference. The Bat Signal made regular appearances in the Batman’s big screen adventures. Unfortunately, there was not much reference information to work with. SUCHAMCHER’S FOREVER SIGNAL: In the 1990’s, Joel Schumacher featured the Bat Signal in his two entries of the Batman film franchise, “Batman Forever” and “Batman & Robin”. While the prop seemed like it might actually be reasonably impressive in it’s scale, it was virtually impossible to make out any of its structural details since the photography was exposed only for the lit portion of the Signal, rendering the rest of it in almost complete darkness. From 2005 – 2012 Director Chris Nolan presented his take on the Batman universe on the big screen. Virtually all aspects of the mythology were re-designed including the famous Bat Signal. The searchlight was presented as a much smaller and much more modern device than in previous films. This Bat-Signal was of no help since the plan was to fabricate a classic, much larger traditional design. As a fan of classic Batman mythology, Playwright Roberto Williams nearly neglected to consider video games during his research into designs for the Bat Signal. But it wasn’t long before he was introduced to the gaming world’s take on the prop. 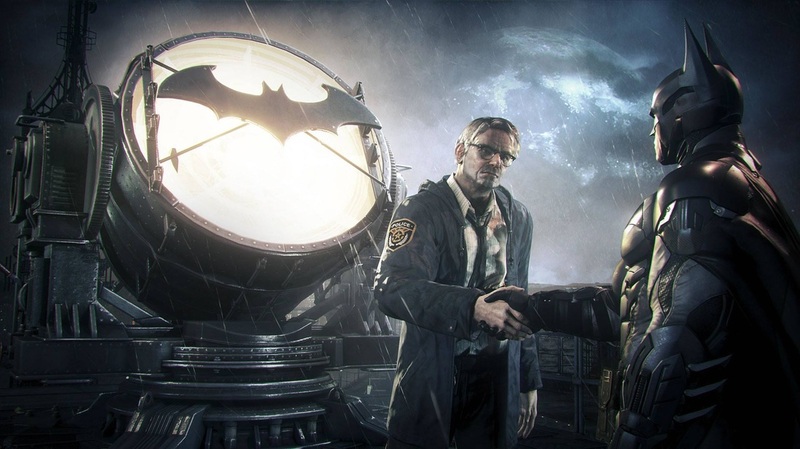 Advance images of the upcoming video game Arkham Knight” for Xbox featured some pretty good image reference for The Bat Signal prop. The design approach seemed somewhat “Steampunk” , which was an approach that Williams was not interested in exploring. However, the large circular base did seem like a logical approach that appealed to him. A NEW HOPE: BURTON GOES GENERAL ELECTRIC!! 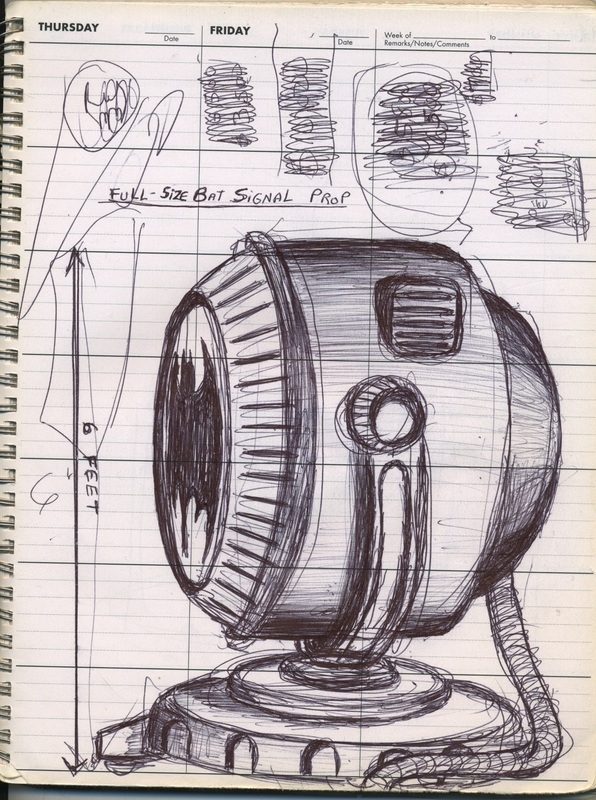 Ultimately, it was Tim Burton’s 1989 Batman film that provided the design inspiration for the Bat-Signal prop that was to be fabricated for the play. 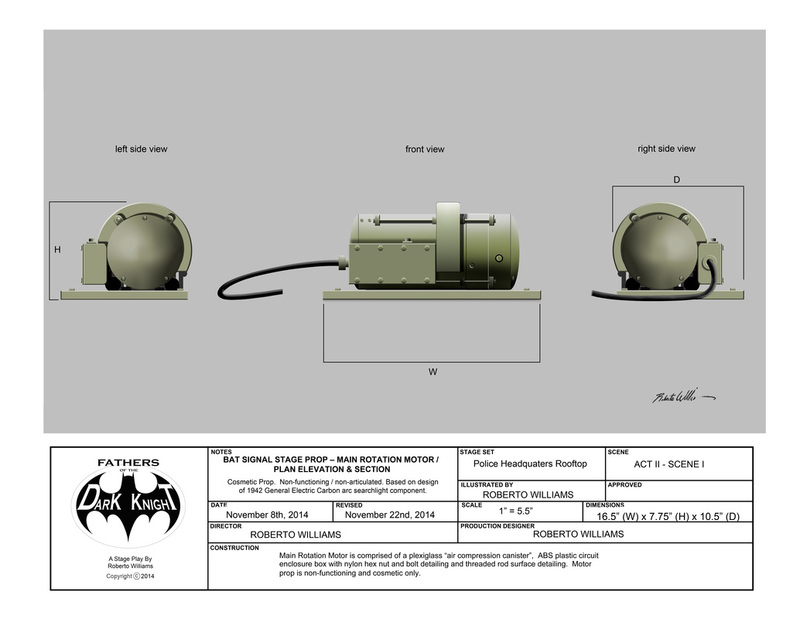 A similar prop also appeared briefly in Chris Nolan’s “Batman Begins” in 2005. It was settled that design cues would come from an old army-surplus World War II, (General Electric or Sperry) anti-aircraft carbon arc search light. Unfortunately, neither film presented a clear enough view of the entire device (down to its base) in order to provide strong reference information. A Google image search on these searchlights revealed them almost exclusively as portable hardware in military applications. These searchlights were always mounted onto the rolling chassis of a small jeep-like trailer with a large generator truck stationed nearby. 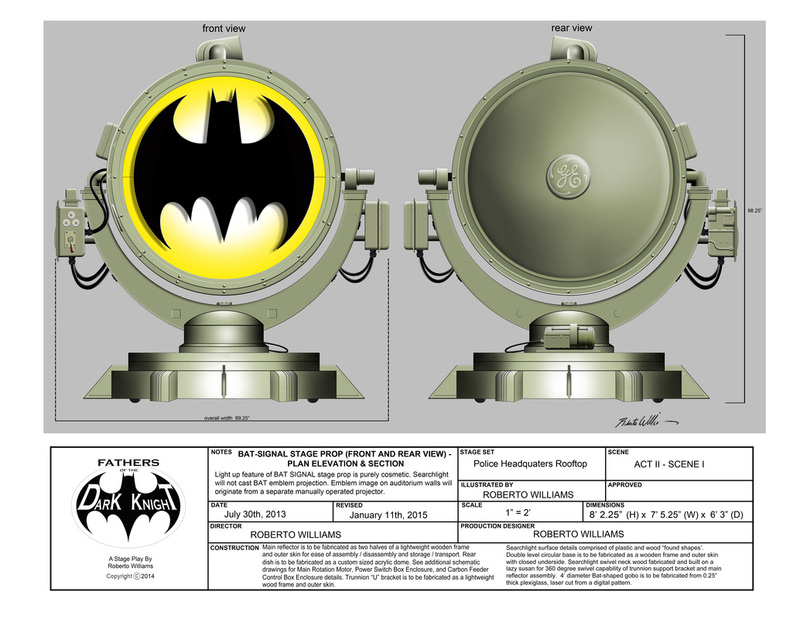 Virtually no photo reference exists of these big lights mounted permanently to any kind of turntable (the configuration which Williams hoped to represent atop Gotham City Police Headquarters). Furthermore, some inquiries made to a searchlight scrapyard in Arizona revealed that these units (even independent of their generator trailers) weighed somewhere in the vicinity of 3 TONS. This weight was not exactly suitable for a community stage, and further evidence that the Bat Signal would have to be designed and fabricated by the production team and as a lightweight cosmetic prop. Creating this kind of searchlight configuration was going to require some artistic license. ROBERTO WILLIAMS: "I made one final online search in a last-ditch attempt to locate a facility that might offer a cosmetic lightweight prop that I could rent or purchase. No luck. And a search for any online articles or instructional youtube videos detailing the construction of a homemade Bat Signal yielded nothing useful for what I had in mind. As an added challenge, the ehow.com website provided this infuriatingly definitive (and discouraging) statement:"
ROBERTO WILLIAMS: "Anyone that knows me knows that I DO love a good challenge… or in this case, a DARE! Time to get started!" 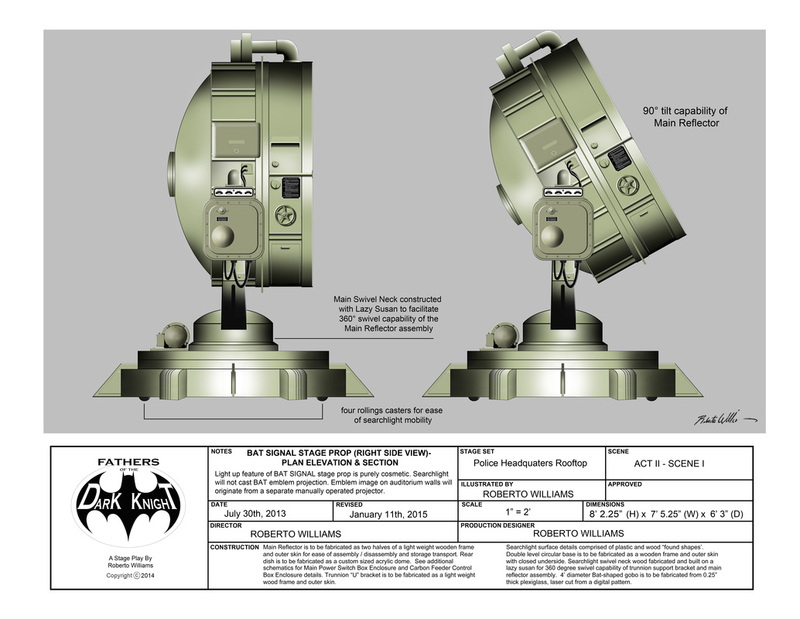 "drawings and deadlines and pools, oh my"
Using the DC Direct Bat Signal toy prop as a reference model, Williams established a very rudimentary working drawing of the searchlight’s range of articulation. This was based off of the prop’s intended range of motion as it would be seen on stage. 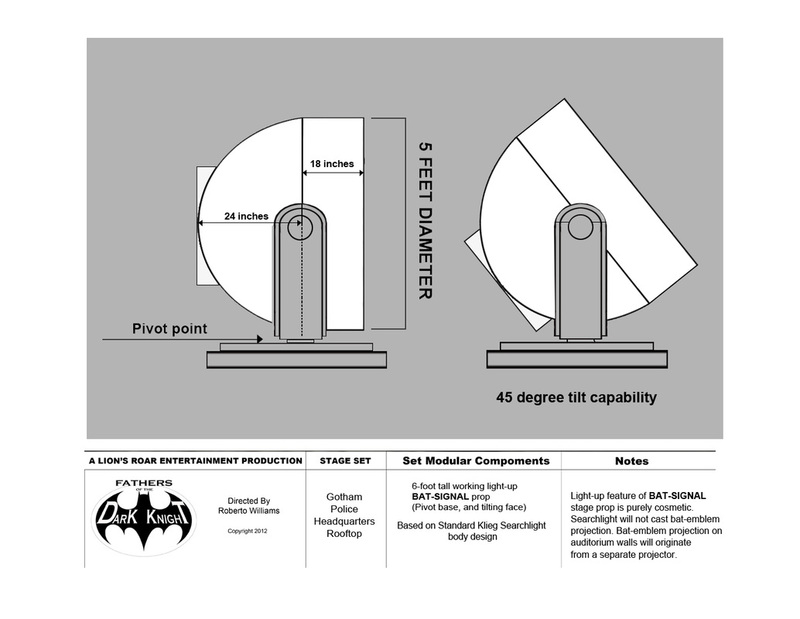 The earliest approach to the fabrication of the Bat Signal prop was to design a device that was based off of readily-available inexpensive shapes. 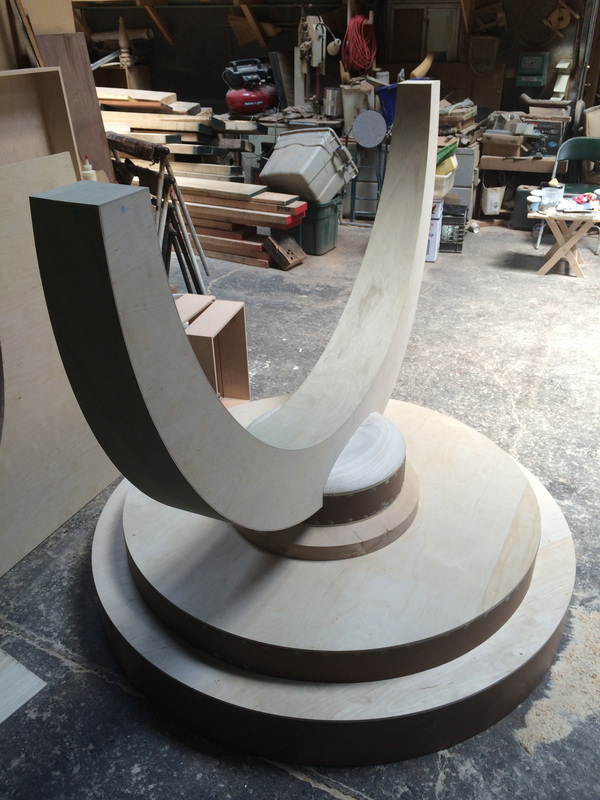 This “kit-Bashing” technique is typically employed as a cost and time saving measure when fabricating unusual shapes. 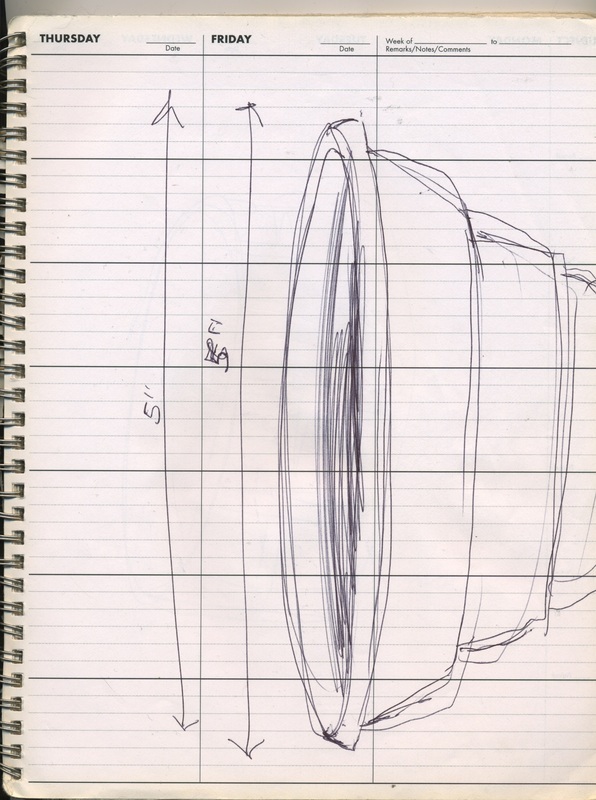 It occurred to Roberto Williams that a Children’s wadding pool (employed vertically) might be a good starting point for the searchlight’s main reflector (as seen here in his earliest production hand sketches immediately following his decision to move forward with the play). An online search yielded nothing in an appropriate size… nor price range that would be suitable for these designs. 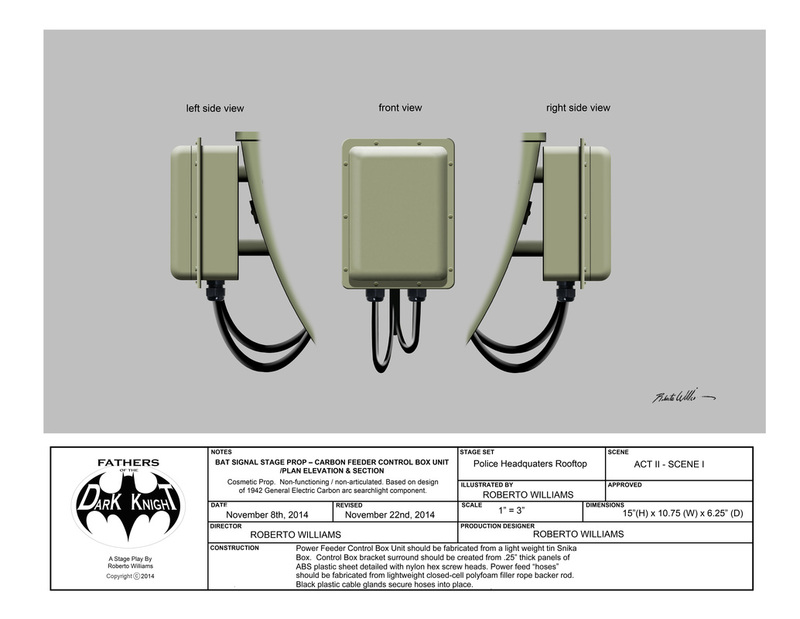 During the earliest days of design for this production, Williams' original plans shied away from rendering the Bat Signal as an accurately-sized prop, and instead opted to suggest a considerably smaller device that would stand (a more manageable) 6 feet in height. 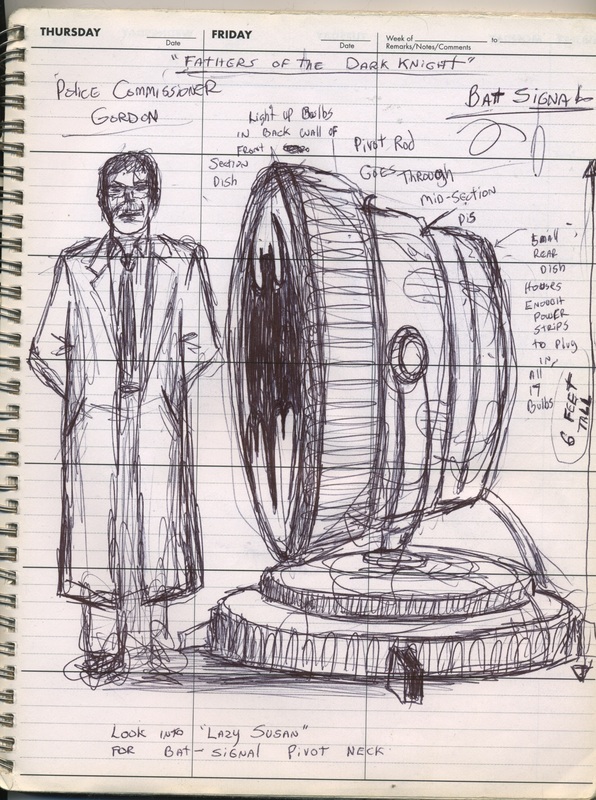 After Williams became more familiar with the specific design aspects of vintage anti-aircraft searchlights, his sketches gradually became more accurate in terms of the prop’s general shape and size. That desire for accuracy led to his realization that much of the Bat Signal main components would have to be designed and built from scratch. Mr. Williams began to map out the construction schematics of the Bat Signal’s basic main components. 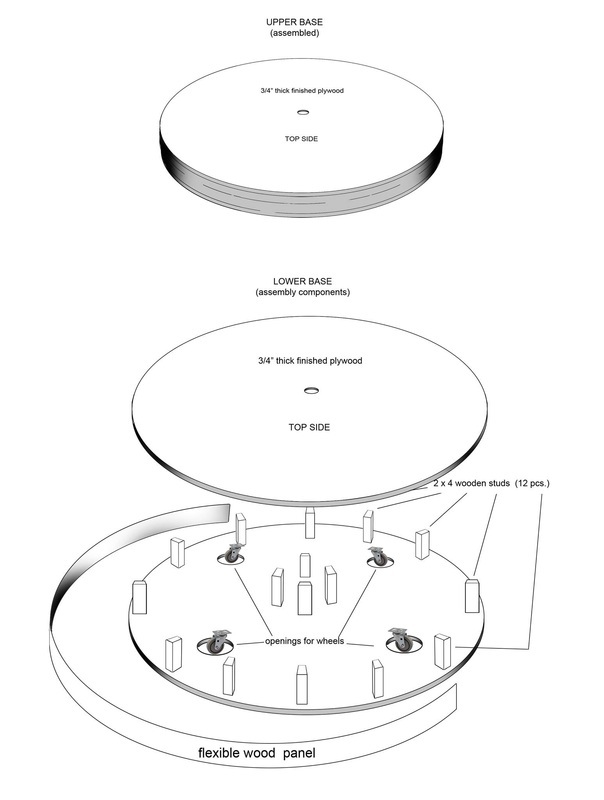 Cross views and layer views provided a blueprint for internal support structures and general forms. 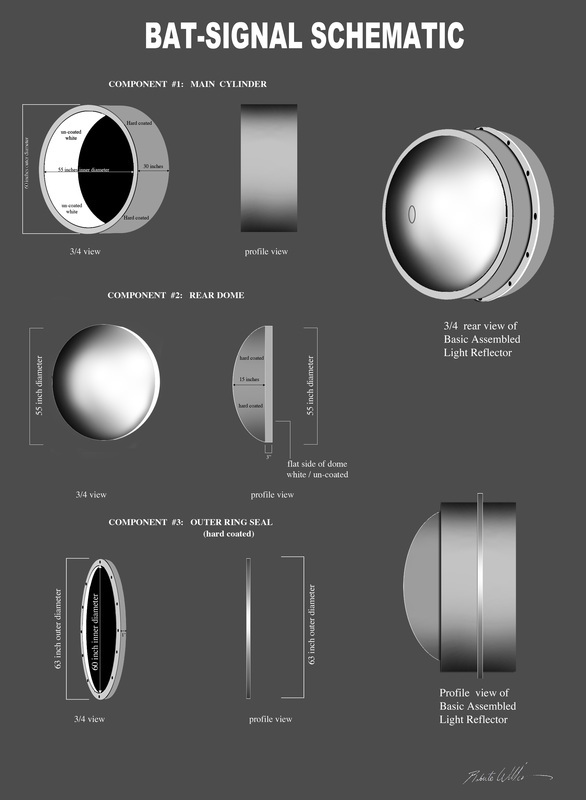 The Bat-Signal Searchlight's Primary 60 " Reflector Drum is rendered here in a construction proposal by Mr. Paul Hubbard of Shape Innovation Inc. and adjusted by Producton Designer Roberto Williams. 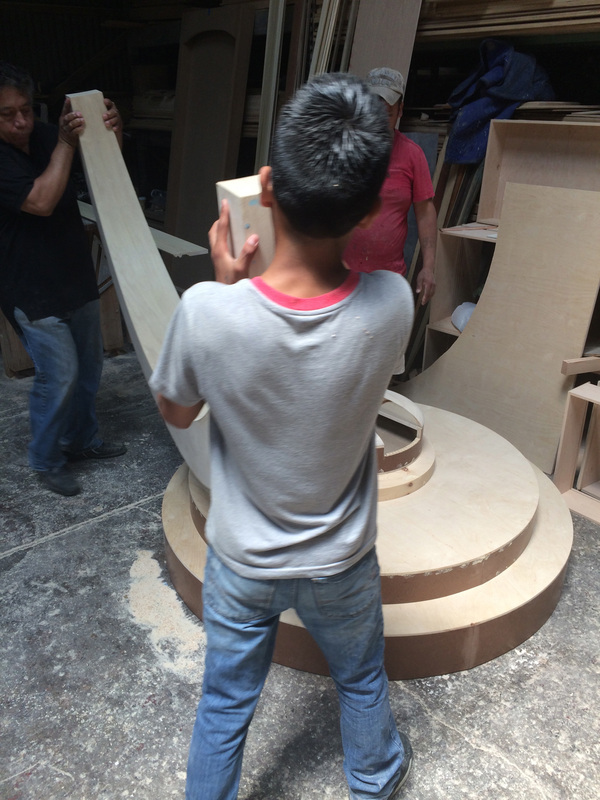 The following months would be spent shopping the designs around to various prop houses and wood fabricators around the country to solicit quotes for its final construction. Time was ticking faster and faster toward the scheduled first performance date, and virtually no one was willing to take on the challenging assignment of building the Bat Signal within the production's established budget. 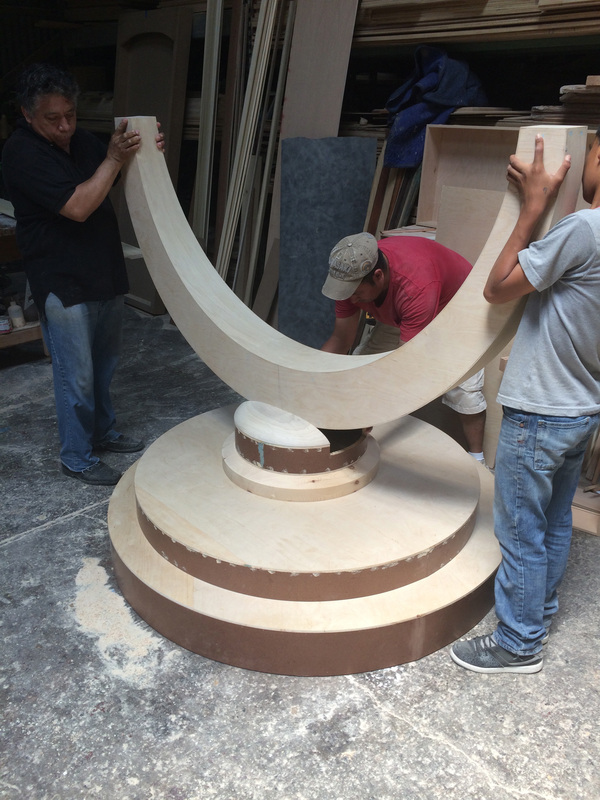 Finally, approximately three months prior to the FOTDK preview performance, ACE WOOD TURNING a small, local, family-owned neighborhood wood fabrication company in Brooklyn, NY agreed to take on the assignment and make the Playwright's renderings into a working, 3-dimensional reality! 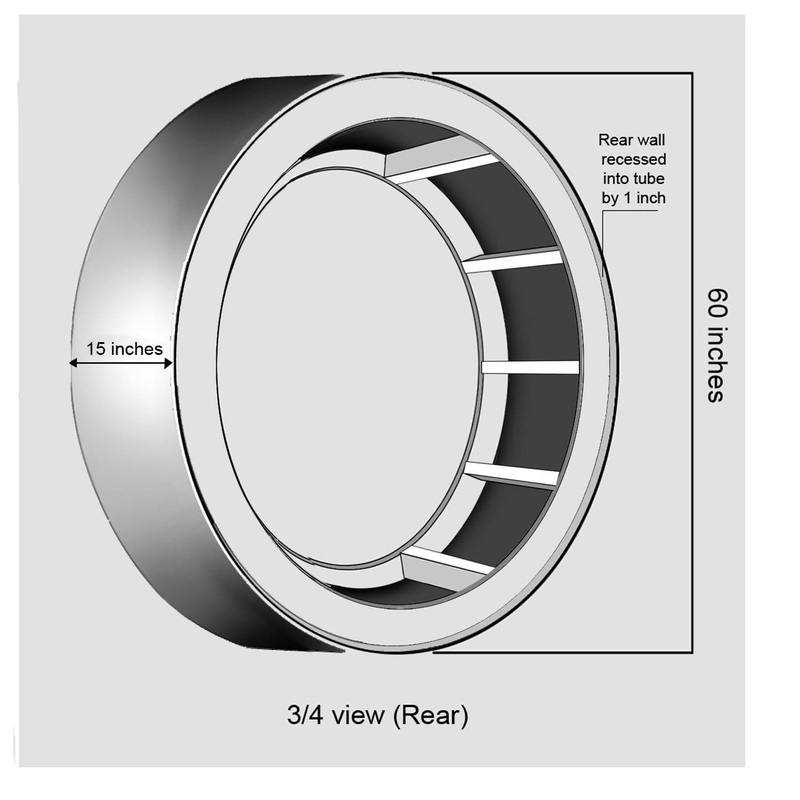 ROBERTO WILLIAMS: "I held several in-person meetings with the proprietor of Ace Wood Turning, Mr. Alfredo Colin, to clarify all specifics that were outlined in my schematics. 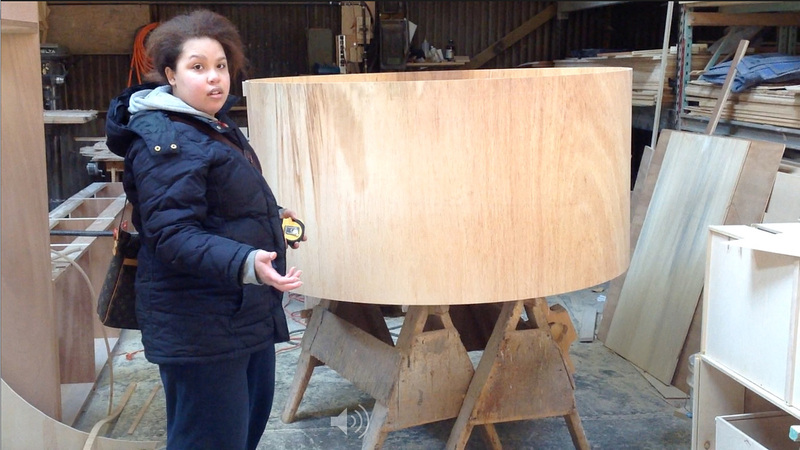 Within three weeks, the cylinder was built to my exacting specifications, and I don’t mind saying that while the finished product was beautifully constructed, I was somewhat overwhelmed by its size and WEIGHT when it was delivered! In fact, I became so nervous when I realized just how massive the main reflector had shaped up to be, that I feared it might actually be too heavy for the Bat Signal’s “U” bracket to support without snapping in half!! And this incredibly heavy had yet to include the weight of the 55” diameter plexiglass rear dome… the plexiglass window face… the 48” diameter plexiglass Bat-shaped face plate… and the assorted “kit-bashed” detailing that would be added to its surface! 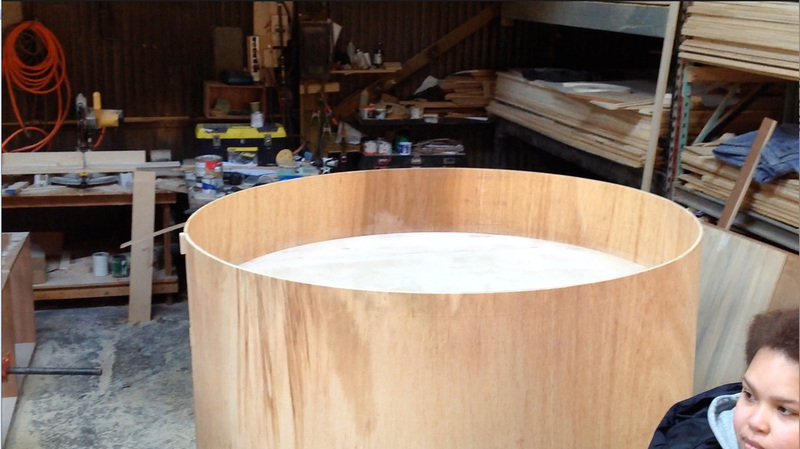 This enormous wood cylinder was already tipping the scales at close to 200 lbs." 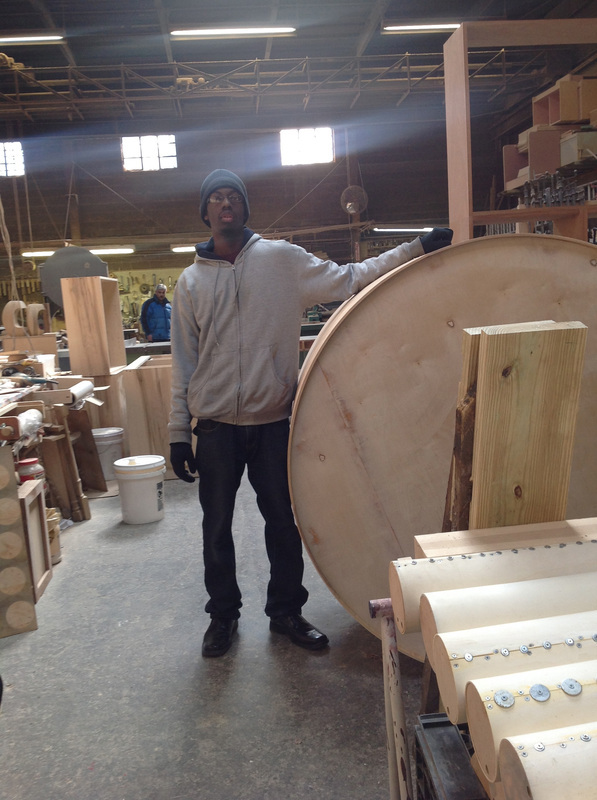 Production Manager Alaja Desilva visits Ace Wood Turning in Brooklyn, NY to inspect fabrication of The Bat Signal Prop's Main Reflector. 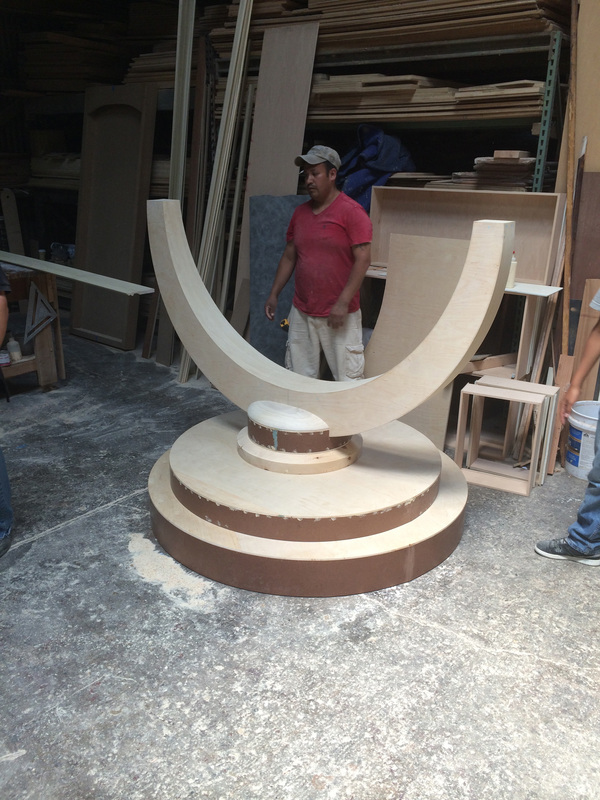 With only 4 days remaining before the start of the scheduled theater load-in and tech week, Alfredo and his team called Williams back to Ace Wood Turning to test and approve the final assembly of the Bat Signal’s primary base and trunnion “U” bracket components. 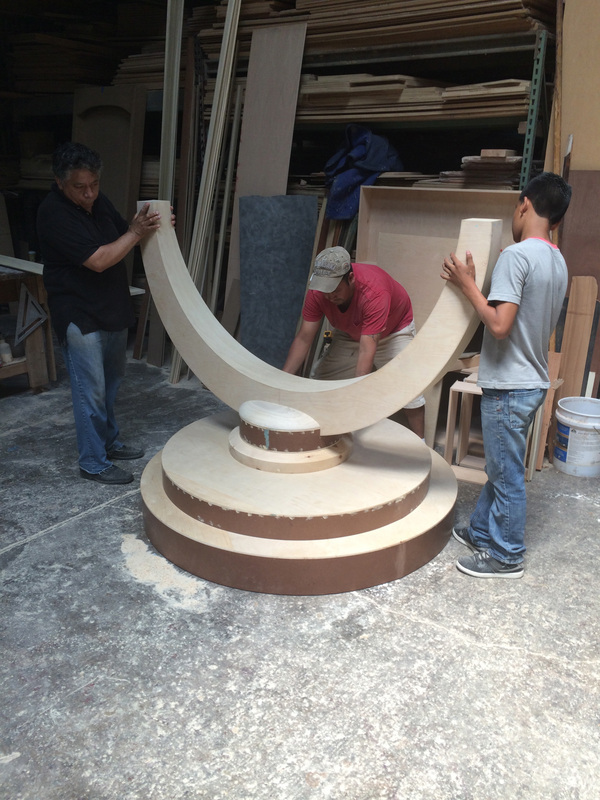 With the two main sections of the Bat Signal's base constructed, carpenters at Ace Wood Turning assemble the Trunion "U" bracket onto the main turntable. 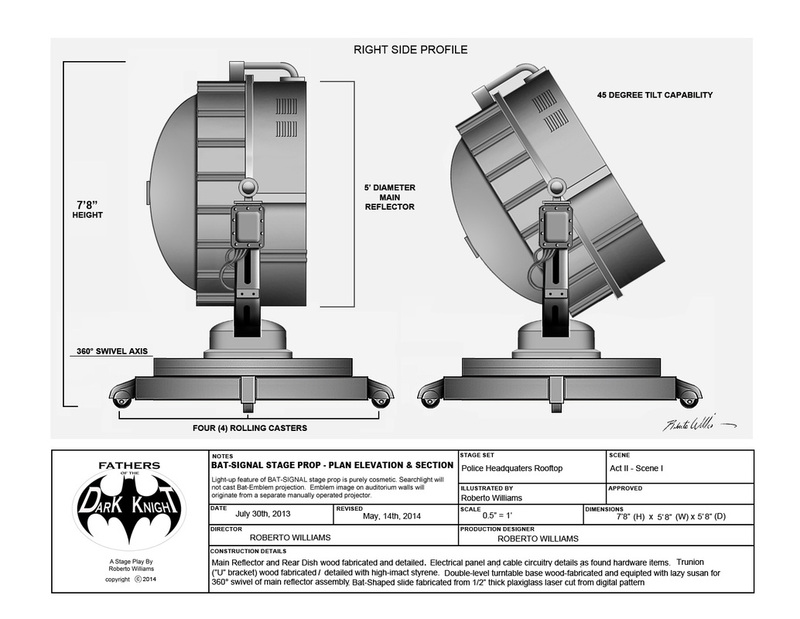 The individual main components of the Bat-Signal were transported to the theater space location for rehearsals with the actors, and the completion of stage blocking and lighting design. 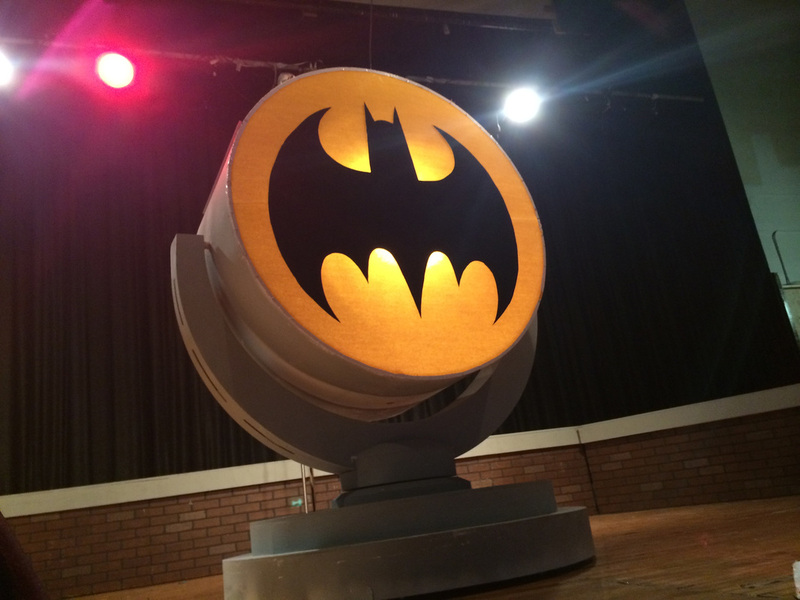 When completed and functioning, The Bat-Signal was a stunning set piece, standing 8 feet in height! 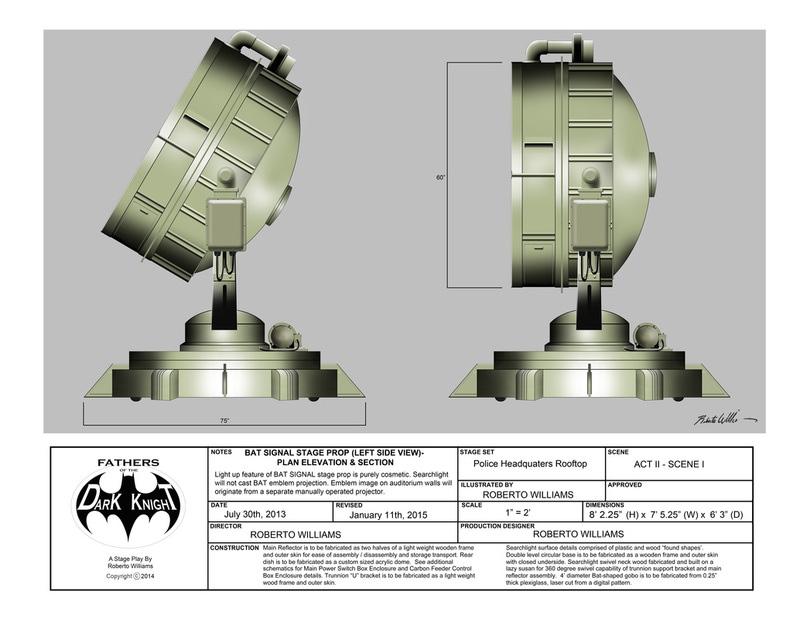 With the basic Bat Signal shape completed, Williams turned his attention to the next phase of construction that would give the prop real personality and realism. 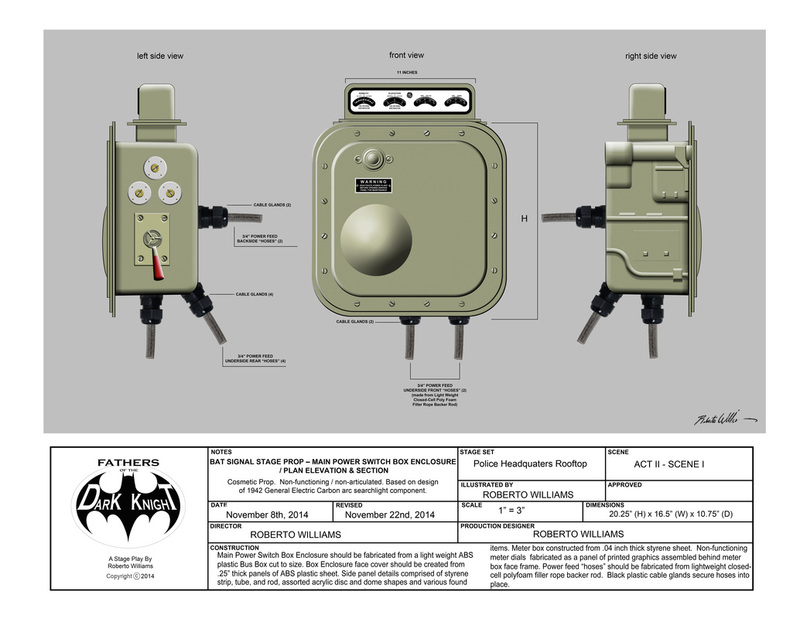 Using the collection of reference photos and you tube videos that he had amassed of 1942 Carbon Arc searchlights, he sat down and drafted all-new Production Design Schematic Drawings of the COMPONENTS AND DETAILS that he planned to add to the Bat Signal.